At Sparta we are inspired by the fact that so many people are starting to see the need, as well as the value in treating trash like an important commodity. The old adage of “one man’s trash is another man’s treasure,” has never been truer than it is today. As Sparta focuses on turning what was once considered garbage (plastics) into a green and valuable product (eco-friendly synthetic diesel fuel), staff and management applaud the efforts of others. Whether it is an individual working out of their garage or an established company that is taking waste and turning it into something new, it is amazing how many people are collecting trash and turning it into viable products. 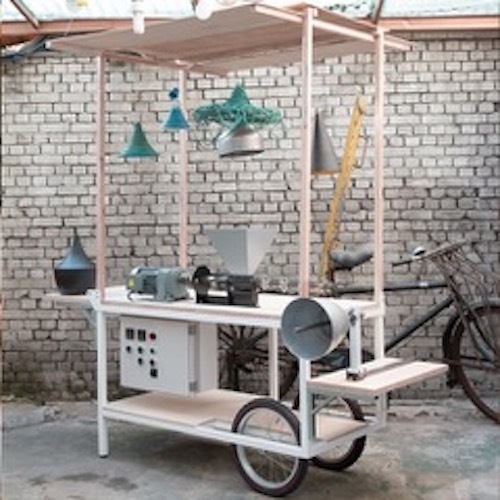 • Desk Factory – there is a small group of people in South Korea that are working on sustainable products, as well as producing a compact, mobile recycling desk factory to inspire people to make products with recycled materials. They have made two version of the desk – one that can make lamps and one that can make toys. • Soap containers – the brand, Method has developed a liquid soap container made from recovered ocean plastic and post-consumer recycled plastic. Method turns to beach clean-up crews and volunteers to collect the plastic waste from beaches in Hawaii. • Shoelaces – Allbirds is a company known for its manufacturing of shoes made of sheep wool, as well as it’s use of recycled cardboard in packaging; however they are also making shoelaces out of recycled bottles. • Coasters – Bope is a small company in Thailand that takes plastic bags and turns them into coasters and tiles. They are also developing a machine to produce bigger products, such as tables and shelves. • Furniture and glassware – the London-based Pentatonic brand has gained recognition all over the world; first for its sustainable fashion and now for its use of trash in the manufacturing of chairs and glassware. Pentatonic is collaborating with Starbucks to turn plastic coffee cup lids into chairs and is taking discarded cell-phone screens and turning them into glassware, such as drinking glasses and bowls. • Bras – not long ago Taiwan was referred to as a garbage mecca but now there is a clothing brand (Girlfriend Collective) that works with a recycling facility in Taiwan that sorts and cleans plastics that the company uses to make bras and leggings. According to the Girlfriend Collective website, each pair of leggings removes two pounds of trash from the ocean. There are many more examples, but clearly the new way of doing business is leaning closer and closer to a circular model. In other words, what we don’t need or want anymore can still be used to create a new product, thus protecting the planet and generating new jobs and revenue opportunities.